In the previous article, I described the four stages of peaking for a major competition. I’m in the second stage of climb for the Olympic trials. The second stage (August-September) mainly consists of intense footwork practice. 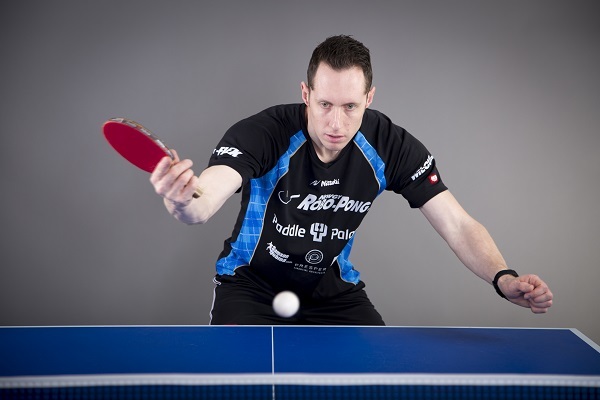 Throughout this phase of training, I’m combining my physical preparation from stage one with daily table tennis practice. The focus during these two months is to play long rallies and develop strong footwork, yet also to continue strength and endurance training. The following online video shows stage two training: http://www.youtube.com/watch?v=qdd5KAQtTgA As you can see, I demonstrated four very important footwork drills: systematic, non-systematic, non-systematic starting with serve, and varied distance drills. Footwork is very important to maintain balance and be in good position to properly hit every ball. At 5.14, my training partner gave me a softer, higher block. Because I was watching his racket and ready to move with my feet, I was easily able to step forward and loop over the table. Being willing to adjust for every ball is the key; I must be careful when doing drills not to get too “robotic”, but instead, be ready to adjust quickly. At 5.31, my partner jammed me in the middle. By taking an extra small step, I was able to maintain my balance and keep attacking. The world’s best players take 2-3 mini steps between every stroke. This allows them to be in good position for nearly every ball. I need to copy their example. At 6.52, my partner blocked fast to my middle. Because I didn’t have time for the full swing, I shortened my stroke and was able to still loop the ball on the table. In a game situation, my goal is to make the opening loop and continue looping. When my opponent makes a very hard or well-placed block, I sometimes need to shorten my stroke or change my distance in order to loop again. At 7.20, my partner got a net ball. I remained calm, slowed down slightly, and was able to still loop the ball on the table. Net balls are very difficult retrieve. The best way to practice returning them is to do it in every training session and match. The third drill is more game-like. This is the same drill as #2 but now I start with a serve. 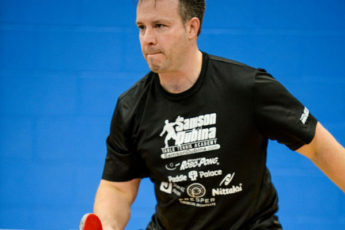 Beginning in stage three of my Olympic preparation, I’ll be doing nearly all the drills starting with a serve. This is one of the best ways to combine practice and matches. If I can’t make an opening loop, my footwork and consistent topspin loops will be useless. The fourth drill is counterlooping from off the table. 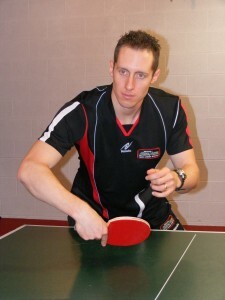 In table tennis, it is very important to train all three distances: near the table, mid-distance, and far from the table. Each player has his preferred distance, but it is still important to be able to have variation in your game. The goals for this drill were to maintain balance, move my feet into position, and loop deep on the table with 60% power. During the next two stages in the coming months, I’ll be doing more counterlooping drills combined with footwork. 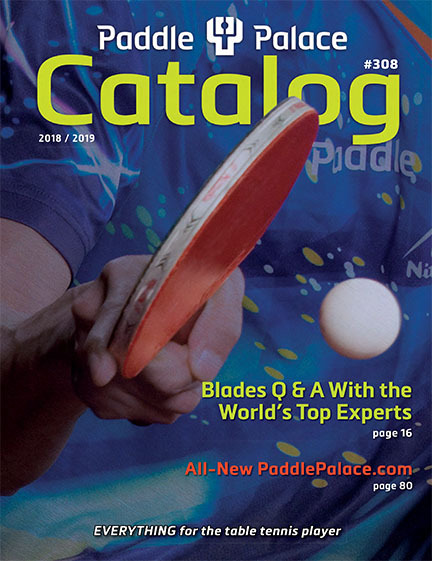 During the month of August, I have improved a couple things: better transition between backhand and forehand, better placement on my forehand opening loop, use of my wrist, more relaxed forehand, and better footwork by taking extra step for the block to my middle. Throughout the six months of training, I’ll be making small changes every week. However, any major technique changes need to be made in the first two stages. By stage three, I should be thinking only of strategy and should be consciously aware of the mechanics of my stroke. I stay aware of every detail by writing them down. On my wall, I have a list of twenty two things that I need to focus on. During practice, I glance at the wall to constantly refresh my memory as to the important points of my training session. I also have a list of my main opponents on my wall. During each training session, I think about playing against them and daily plan strategies on how to beat them. Last week, I played in my first tournament after taking a break in July for stage one. This tournament proved to be very helpful by identifying weaknesses and by encouraging me in areas where I have shown great improvement. I made it to the Open finals before losing 3-1 to Damien Provost rated 2670. Now that I’m preparing to move from stage two to stage three in the training, I will be focusing on starting the drills with serve. With the added practice of serve and serve return, I should start having better results during matches. During this phase, it is also important to maintain my base and keep my balance and footwork as good as possible. Next month’s posting will be about the full transition into stage three.